Plants annual, papillate, glabrous. Stems prostrate to ascending, usually copiously branched, 1-4 dm; not rooting at nodes. Leaves: petiole clasping; blade spatulate to ovate, 1-2.5 cm, base tapering. Inflorescences: flowers usually solitary; pedicel usually absent or to 1 mm. Flowers: calyx lobes pink or purple adaxially, with subapical abaxial appendages, ovate, 3 mm; stamens 5; pistil 2-3-carpellate; ovary 2-3-loculed; styles 2-3. Capsules ovoid, 4-5 mm. Seeds 30-50, blackish brown, 1 mm, iridescent, smooth. Flowering summer-fall (year-round in se Tex.). Sandy shores, beaches, dune swales, brackish marshes, banks along or near coasts, waste grounds, ballast; 0-100 m; Ala., Del., Fla., Ga., Kans., La., Md., Miss., N.J., N.Y., N.C., Okla., Pa., S.C., Tex., Va.; West Indies. Sesuvium maritimum is often overlooked in coastal environments, perhaps due to the small size of some individuals, particularly in the northern portions of its distribution. Nonetheless, this species appears to be infrequent (and possibly in decline) in coastal environments of northern states (e.g., Delaware, Maryland, New Jersey, and New York), where development of the coast has impacted sensitive environments. This species is also present in Kansas and Oklahoma but its distribution in those states is currently not well known. The name Sesuvium sessile Persoon has been misapplied to this species. 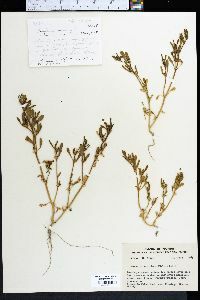 Annual, glabrous and succulent throughout, prostrate to ascending, 1-3 dm, freely branched; lvs oblanceolate to broadly spatulate, 1-3 cm, the members of a pair commonly unequal; sep 2-3 mm including the short appendage; stamens 5; fr ovoid, 4 mm; seeds numerous, smooth, under 1 mm. Sea-beaches; N.Y. to Tex. and W.I. ; scattered inland in Kans. and Okla. July-Sept.